I'll admit it, I inwardly groaned when "Happy Birthday Royal Baby" dropped through our letterbox as I expected it to be one of those awful 'cash-in' books released to mark the occasion of Prince George's 1st birthday. 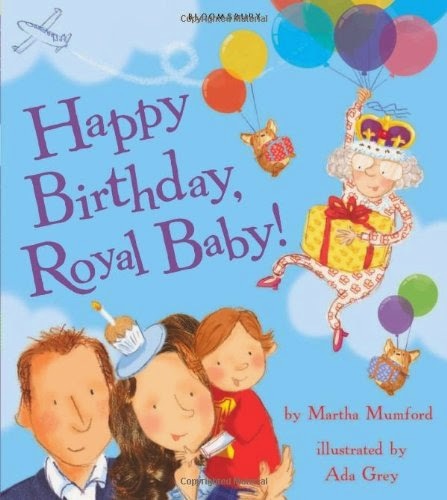 I should've known better - this is Bloomsbury we're talking about, and they don't pin their colours to any old book, this is actually one of the funniest and most entertaining 'royal' tales we've seen in a very long time. Preparations are afoot for the Royal Birthday! Auntie is drafted in to organise the party and more importantly the nosh (because she's a bit of a whizz at that, apparently!). Grandma and Grandad oversee the Royal Balloon Blower to make sure he fills the royal palace with balloons, and respected figures from far and wide gather for the celebrations, bringing huge presents with them by the truckload. But something's wrong, the little prince does not look happy (Martha must've seen the many press pics of George looking like a little grumpy puss!) In fact he starts crying and no one seems to know what to do to cheer him up. No one should cry on their birthday should they? You'll have to read the book to find out what it is - suffice to say that this is the point in the book where all parents will look at each other and exchange a knowing glance of "yep, been there, done that!"